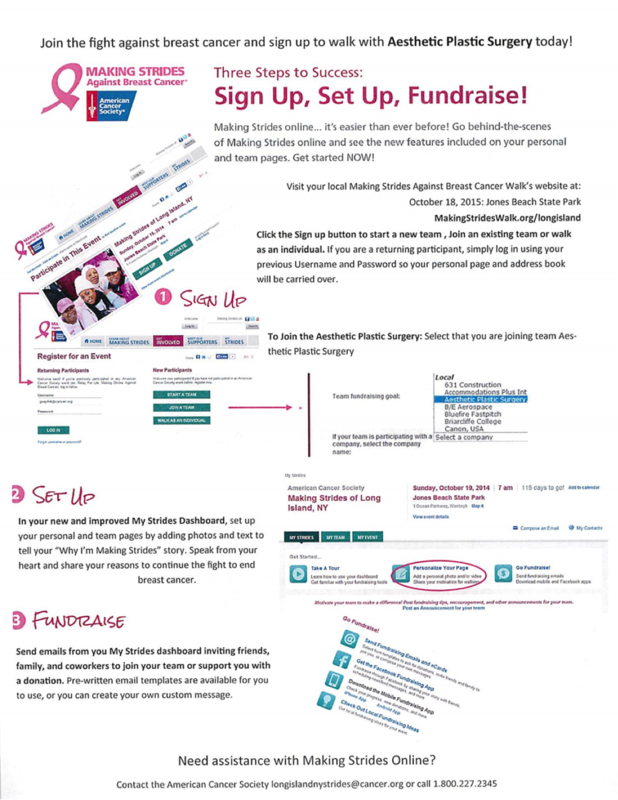 Many of you have been asking about the upcoming Making Strides Against Breast Cancer event…so here it is! Mark it on your calendars now - The Making Strides Against Breast Cancer Walk will be on Sunday, October 18th at 7:30 a.m. at Jones Beach State Park! Last year, our fabulous TEAM raised $137,385.00 for the fight against Breast Cancer! Your combined efforts placed us as the number 12 fundraiser in the NATION! On Long Island, we came in second place behind NYSUT! Congratulations on ALL of your successes from 2014! 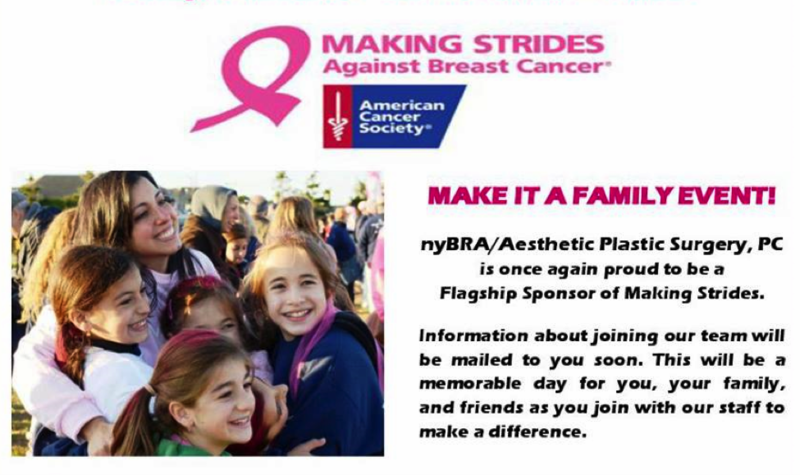 This year, Aesthetic Plastic Surgery, PC/New York Breast Reconstruction Associates (NYBRA) are once again proud Flagship Sponsors of the Walk and we ask you to join us for this beautiful event and worthwhile cause. Soon, everyone will be receiving a letter in the mail with a contribution form, the Online Fundraising Instructions for registering with the Aesthetic Plastic Surgery team and a Tip Sheet. As you enter Field 5 on the day of the event, look for our banner on our tent: Dr. Randall Feingold, Dr. Ron Israeli, Dr. Peter Korn, Dr. David Light and Dr. Jonathan Bank. We will be there to meet you with sweatshirts, coffee, and breakfast. This year our sweatshirts will be Heather Red. Be sure to arrive by 7:00 a.m. so you have time to eat breakfast, participate in our group photo, and mingle with our staff and your Sisters! If you would like to get started forming a new team or joining an existing team, go to the Aesthetic Plastic Surgery team site. In the middle of the page, follow the "Form A New Team" link to start your own team and make sure to select our company name (Aesthetic Plastic Surgery) from the Team Company drop-down menu. Or, click the "Join A Team" link to join an existing company team. If you are a returning participant, you can log in using your previous username and password to retrieve your personal page and address book. 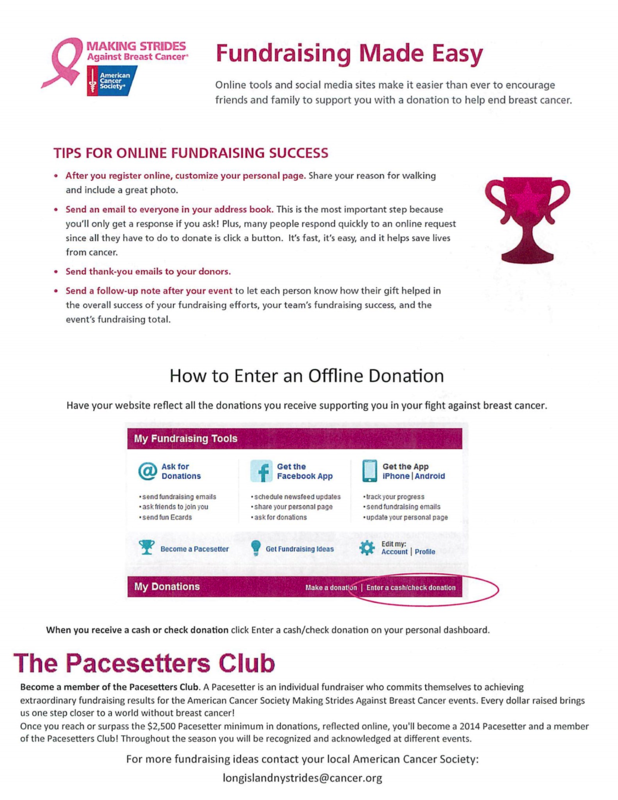 If you need any assistance with Making Strides Online or have questions about fundraising ideas, contact the American Cancer Society at longislandnystrides@cancer.org or 800.227.2345.